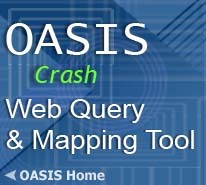 OASIS Crash Query & Mapping Tool: Create tables and maps of Motor Vehicle Crash statistics and indicators. In this user-friendly tool, you choose which statistics to display in your maps. This OASIS tool is provided under a grant from the Governor’s Office of Highway Safety and the National Highway Traffic Safety Administration in association with the Georgia Department of Transportation and the Georgia Department of Public Health. OASIS (Online Analytical Statistical Information System) is a suite of tools used to access the Georgia Department of Public Health's standardized health data repository. With this tool you can obtain tables and maps of Georgia motor vehicle crashes from 2003 to current by County. Indicators are selectable by many attributes such as day of the week, time of day, holiday weekends, manner of collision, initial event, contributing cause and more. The geography used for reporting is the location where the crash occurred. Multiple selections can be made in many of the choices by holding down the Control or Shift keys and clicking on each selection. Copyright © 2018 Version 1.0 CV: 1.0 Georgia Department of Public Health, Office of Health Indicators for Planning (OHIP), all rights reserved.